Athanasius of Alexandria is the traditional author of the creed named after him, but most scholars now doubt his authorship of it. The Athanasian Creed, also known as (Quicumque vult) from its opening Latin words, is a statement of Christian trinitarian doctrine traditionally ascribed to St. Athanasius, Archbishop of Alexandria, who lived in the fourth century C.E. Its theology is closely akin to that found in the writing of Western theologians, especially Saints Ambrose of Milan, Augustine of Hippo, and Vincent of Lérins. It was used in the Roman Catholic Church, as well as the Anglican and Lutheran churches, but rejected by the Eastern Orthodox Church, in part because of its inclusion of the filioque, a phrase indicating that the Holy Spirit comes from both Father and the Son, rather than from the Father alone. Today, however, the Athanasian Creed is rarely used even in the Western Church and the attribution to Athanasius has been almost universally rejected. From its internal language, scholars believe it was designed to overcome not only Arianism, the heresy against which Athanasius famously fought, but also Nestorianism, Monophysitism and other later heresies which had not yet arisen in Athanasius' day. Moreover, it seems to have been composed in Latin, not the Greek in which Athanasius wrote. It is still recited occasionally in the Catholic and other western churches, and is seen as one of the clearest creedal expressions of western trinitarian doctrine. Creeds came into use in the Christian church as statements of faith designed to summarize the basic teachings of the church and especially to refute unacceptable doctrines, or heresies. Athanasius was the champion of the orthodox cause in the struggle against Arianism, which taught that Jesus, as the Son, did not co-exist with the Father from eternity, but was created by Him at a certain point. The creed was attributed to Athanasius because of its clear expression of several points with which he himself taught. However, this attribution is traditional, and does not come from the writings of Athanasius himself, nor was it attributed to him by his contemporaries. Liturgically, the Athanasian Creed was recited by the Western (Roman Catholic) Church. It was never used in the Eastern (Orthodox) Church, which strongly objected to some of its language. In Roman Catholic churches, it was read traditionally on Sundays after Epiphany and Pentecost, with some exceptions. In the 1960 reforms, however, it was reduced to once a year on Trinity Sunday. It has been effectively dropped from the Catholic liturgy since Vatican II. In Lutheranism, the Athanasian Creed is—along with the Apostles' and Nicene Creeds—one of the three ecumenical creeds placed at the beginning of the 1580 Book of Concord, the historic collection of authoritative doctrinal statements (confessions) of the Lutheran church. It is still used in the liturgy on Trinity Sunday. The is included in the Christian Reformed Churches of Australia's Book of Forms (publ. 1991) but is rarely recited in public worship. It is retained in the Anglican Book of Common Prayer. The first half of the creed confesses the Trinity (one God in three persons). With poetic repetition it ascribes divine majesty and characteristics to the Father, the Son, and the Holy Spirit, each individually. At the same time it clearly states that, although all three are individually divine, they are not three gods but one God. 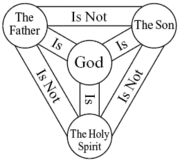 Furthermore, although they are "one God," the Father, Son, and Holy Spirit are distinct from each other. The Father is neither made nor begotten; the Son is not made but is begotten from the Father; the Holy Spirit is neither made nor begotten but proceeds from the Father and the Son. Although the creed uses philosophical terms such as person and substance, it does not try to define them philosophically. Rather the creed presents the traditional Christian doctrine of the Trinity, setting the seeming logical paradoxes side by side. 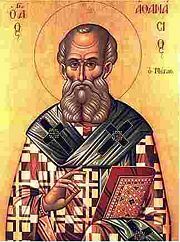 It was ascribed to St. Athanasius around the ninth century, due largely to its anti-Arian attitude, since Athanasius was the orthodox champion in the battle against Arianism. This view was contested in the seventeenth century, and is generally rejected today. Reasons for rejecting Athanasius as the author are: 1) The creed originally was written in Latin. 2) It is not mentioned by Athanasius or his contemporaries. 3) It appears to address Christological controversies that developed after Athanasius died, as well as against the Arian heresy against which Athanasius famously fought. Most of today's historians agree that it originated in Gaul around 500. A need for a clear confession against Arianism—going even beyond the Nicene Creed originally designed to refute Arianism—arose in western Europe when the Ostrogoths and Visigoths, who had Arian beliefs, successful invaded the western Roman Empire at the beginning of the fifth century. The creed's theology is closely akin to that found in the writing of Western theologians, especially Ambrose of Milan, Augustine of Hippo, and Vincent of Lérins. J.N.D. Kelly, a contemporary patristics scholar, believes that St. Vincent of Lérin is its most probably author. The Athanasian Creed affirms what has been called the "Shield Trinity" formula, affirming that "the Spirit was neither made nor created, but is proceeding from the Father and the Son." Eastern Orthodox theology, on the other hand, affirms that the Holy Spirit comes from the Father alone. ↑ The inclusion of the filioque ("and the son") is noteworthy, since this term is absolutely rejected by the Eastern Orthodox Church, which greatly honors Athanasius. Athanasius: Select Works and Letters www.ccel.org. This page was last modified on 22 April 2016, at 15:15.